Yet again, Duke is playing the part of a tease. Duke Nukem will never die, and when it comes to his classic 3D outings, we're totally ok with that. Recently released on Steam, Duke Nukem 3D: Megaton Edition packs together the original Duke Nukem 3D along with the enhanced Duke Nukem 3D: Atomic Edition and three expansion packs: Life's a Beach, Duke it Out in D.C. and Duke: Nuclear Winter. It also boasts several servings of Steam features, including achievements and cloud support. Notably missing from this initial version, however, is any form of co-op or multiplayer, both of which were present in earlier releases. There's no cause for alarm just yet, as publisher Devolver Digital has confirmed that both features will arrive in the future as a free update, along with even more achievements and additional Duke Nukem 3D expansion packs. 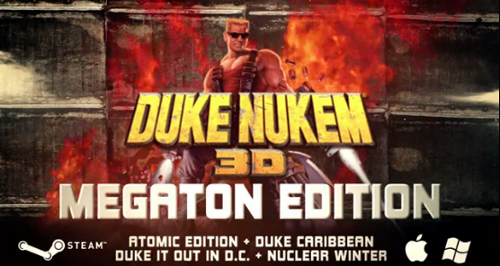 Duke Nukem 3D: Megaton Edition is available for PC and Mac via Steam. No date for the co-op feature release has been announced. Page created in 0.7546 seconds.